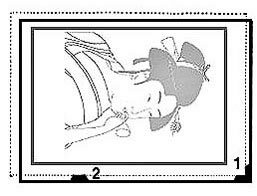 The kentô ("pass mark": 見当) is composed of two guides, the right-angled kagi ("key") in the lower right corner (see #1), and the straight-line hikitsuke ("draw stop") along an adjacent side (see #2). 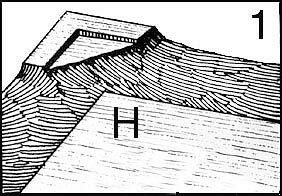 During printing the paper rests on the shallow vertical "steps" of the kentô slightly below the horizontal plane of the original wood surface (see "H"). In the illustration directly below, the keyblock and its kentô are represented by the black solid lines and shapes. 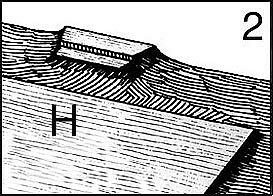 The carved portion of the block shows the image (partly visible through the paper placed on top) and its outer edges in gray (the rest of the original wood has been cut away). The carved design is a mirror image of its printed orientation (see How is a print made and Binnie Keyblock). The dashed lines indicate the perimeter of the paper. After printing, the paper is trimmed, removing the kentô marks.